(Nanowerk News) Robots are increasingly being used in place of humans to explore hazardous and difficult-to-access environments, but they aren’t yet able to interact with their environments as well as humans. 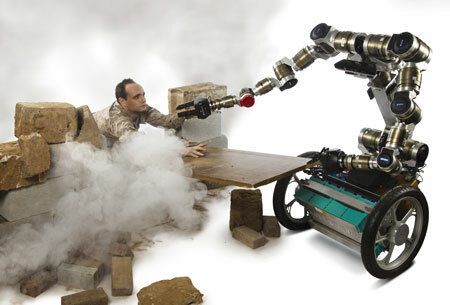 If today’s most sophisticated robot was trapped in a burning room by a jammed door, it would probably not know how to locate and use objects in the room to climb over any debris, pry open the door, and escape the building. To address the complexity of the human-like reasoning required for this type of scenario, Stilman is collaborating with researchers Pat Langley and Dongkyu Choi. Langley is the director of the Institute for the Study of Learning and Expertise (ISLE), and is recognized as a co-founder of the field of machine learning, where he championed both experimental studies of learning algorithms and their application to real-world problems. Choi is an assistant professor in the Department of Aerospace Engineering at the University of Kansas. Langley and Choi will expand the cognitive architecture they developed, called ICARUS, which provides an infrastructure for modeling various human capabilities like perception, inference, performance and learning in robots. “We believe a hybrid reasoning system that embeds our physics-based algorithms within a cognitive architecture will create a more general, efficient and structured control system for our robot that will accrue more benefits than if we used one approach alone,” said Stilman. After the researchers develop and optimize the hybrid reasoning system using computer simulations, they plan to test the software using Golem Krang, a humanoid robot designed and built in Stilman’s laboratory to study whole-body robotic planning and control.